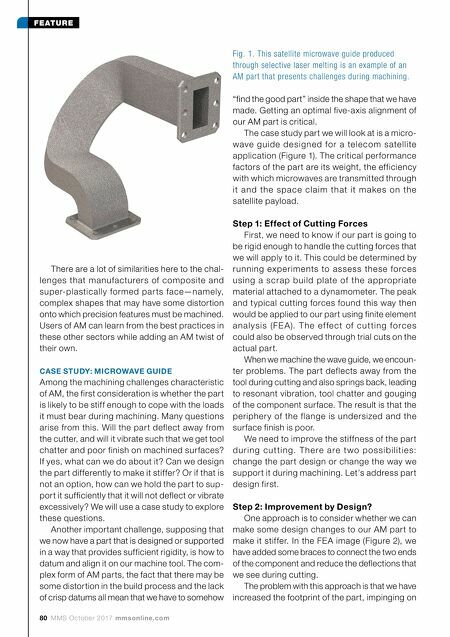 80 MMS October 2017 mmsonline.com FEATURE There are a lot of similarities here to the chal- lenges that manufacturers of composite and super-plastically formed par ts face—namely, complex shapes that may have some distortion onto which precision features must be machined. Users of AM can learn from the best practices in these other sectors while adding an AM twist of their own. 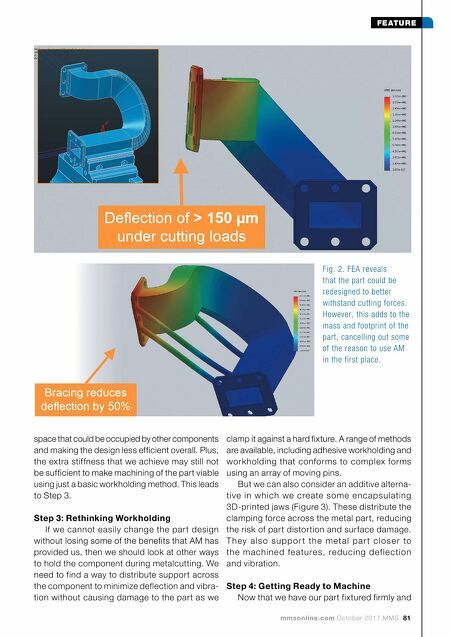 CASE STUDY: MICROWAVE GUIDE Among the machining challenges characteristic of AM, the first consideration is whether the part is likely to be stiff enough to cope with the loads it must bear during machining. Many questions arise from this. Will the part deflect away from the cutter, and will it vibrate such that we get tool chatter and poor finish on machined surfaces? If yes, what can we do about it? Can we design the part differently to make it stiffer? Or if that is not an option, how can we hold the part to sup- port it sufficiently that it will not deflect or vibrate excessively? We will use a case study to explore these questions. Another important challenge, supposing that we now have a part that is designed or supported in a way that provides sufficient rigidity, is how to datum and align it on our machine tool. The com- plex form of AM parts, the fact that there may be some distortion in the build process and the lack of crisp datums all mean that we have to somehow "find the good part" inside the shape that we have made. Getting an optimal five-axis alignment of our AM part is critical. The case study part we will look at is a micro- wave guide de signe d for a te le com s ate llite application (Figure 1). The critical performance factors of the part are its weight, the efficiency with which microwaves are transmitted through i t a n d th e s pac e c l a im th at i t m a ke s o n th e satellite payload. Step 1: Effect of Cutting Forces First, we need to know if our part is going to be rigid enough to handle the cutting forces that we will apply to it. This could be determined by running experiments to assess these forces using a scrap build plate of the appropr iate material attached to a dynamometer. The peak and typical cutting forces found this way then would be applied to our part using finite element a n a l ys i s (FE A ). T h e ef fe c t of c u t ti n g fo rc e s could also be observed through trial cuts on the actual part. When we machine the wave guide, we encoun- ter problems. The part deflects away from the tool during cutting and also springs back, leading to resonant vibration, tool chatter and gouging of the component surface. The result is that the peripher y of the flange is undersized and the surface finish is poor. We need to improve the stiffness of the part d u r i n g c u t ti n g. T h e re a re t wo p o s s i b i l i ti e s: change the part design or change the way we support it during machining. Let's address part design first. Step 2: Improvement by Design? One approach is to consider whether we can make some design changes to our AM part to make it stiffer. In the FEA image (Figure 2), we have added some braces to connect the two ends of the component and reduce the deflections that we see during cutting. The problem with this approach is that we have increased the footprint of the part, impinging on Fig. 1. This satellite microwave guide produced through selective laser melting is an example of an AM part that presents challenges during machining.